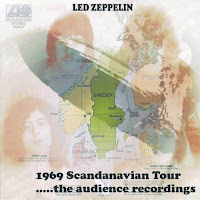 As the title of this bootleg shows, there is *still* some confusion on the date and location of this show, it is generally accepted to be Copenhagen on 3/16, so I'll go along with that. There is apparently better sources of this out there that I might need to go looking for, mine isn't the greatest. About 22 minutes long, 'soundboard', though not sure of the lineage for this bootleg. Stryder rates this bootleg as being a '9' but that seems awfully generous. With all that said, this clip is far and away better than the audience source, but sadly not complete. Official site dates this as 03/14/69 Stockholm. I'm inclined to agree per the 2 newspaper writeups. Also, my aud tape dated 03/16 doesn't match up with the soundboard.